In recent decades, sink drain plumbing is done with plastic pipe and fittings. This has mostly replace the old chrome plated brass pipe that was popular for a long time. Chrome plated brass is still available, but it costs more and is harder to install. For related information see the articles 'Troubleshooting Drain Problems' and 'Repairing a Clogged Kitchen Sink'. The drains take away the excess water when you run the sink. A lot of times the water is dirty and the drain takes it to the sewer. The sink drain also provides drainage for the dishwasher and garbage disposal. Any time you have water involved you can have leaks. When you have drains, you have a potential for clogs. Years ago all sink drains were made of brass sometimes with a chrome coating. The metal pipes will corrode over time and need to be replaced. You can still buy the brass fittings, but they cost more than the plastic ones do. Read on and find out if this is the kind of repair that you want to tackle. The evaluations will help you determine if it is worth your time. After you consider the information decide if you want to repair your sink drain plumbing. An experienced plumber can replace some or all the parts on your sink drain plumbing in a half an hour. It may take you a little longer. Allow $50 to $75 for the service call and $25 to $75 for parts. The higher figure would be for the chrome fittings. Working on sink drain plumbing is not that hard and requires a minimum of tools. Leaks can often be taken care of by tightening one of the nuts. Try to determine which fitting is leaking and tighten it, gently, but firmly. See below for more info. Sink drains can be a little messy. The trap will have some dirty water in it. For a clogged sink you will have more dirty water. Take precautions for dealing with the water. Not having the right parts can also be a problem. Finding parts late at night may not be easy. Try to anticipate what you will need ahead of time a few extra nuts and washers is a good idea. Troubleshooting sink drain problems is a process of elimination, several things can be wrong. The first would be leaks. A lot of time tightening the fittings is all that is needed. For old chrome or brass pipes they may have corroded and started leaking. In that case you will have to replace them. Tightening up the fittings can eliminate most leaks. It is easy, just use a pair of adjustable pliers. Hold the fitting with one hand and use the pliers on the nut. Don't over tighten. You want them snug not stripped. Another reason would be a clogged sink. Getting rid of a clog might involve taking some of the drain pipes apart. Many times you will find the clog in the drains. Other times the line will need to be snaked to fix it. You will need to remove one or more fittings to get access to the drain line. Modifications and home improvements can also cause you to disturb the sink drain plumbing. A new disposal or a new sink would be a great addition to the kitchen. You will probably need to make adjustments when you replace or revise the fixtures. Knowing the names of the parts and what they look like is helpful. The article 'Sink Drain Parts', provided you with some pictures and a brief description of the various components you may need to use. Most of the time, drain pipes will need to cut to fit. There are a few tricks and the article 'Cutting Sink Drain Pipes', showed you what they are. Finally, the article 'Assembling Sink Drain Pipes' discussed putting the plumbing pipes together. Tightening them correctly is important so that you do not get leaks. 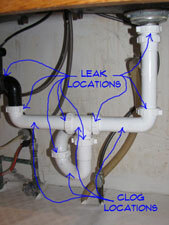 You have found out by now that sink drain plumbing is not that difficult. The hardest part is getting the right parts. If you take your time and cut everything the right length things will go smoothly. Sink drain plumbing can be rewarding. Perhaps not as rewarding as painting or sculpting, but close. Well maybe not close, I've heard of painters that get really get into their work, maybe close. Now that you are done with this project you can decide what you want to do next on your list.